It is a well known phenomenon that the color of a drink has an influence on its taste. This influence is so strong that even experts believe to identify red wine aromas in a white wine colored red with odorless food coloring (Morrot, Brochet, & Dubourdieu, 2001, Brain and Language). 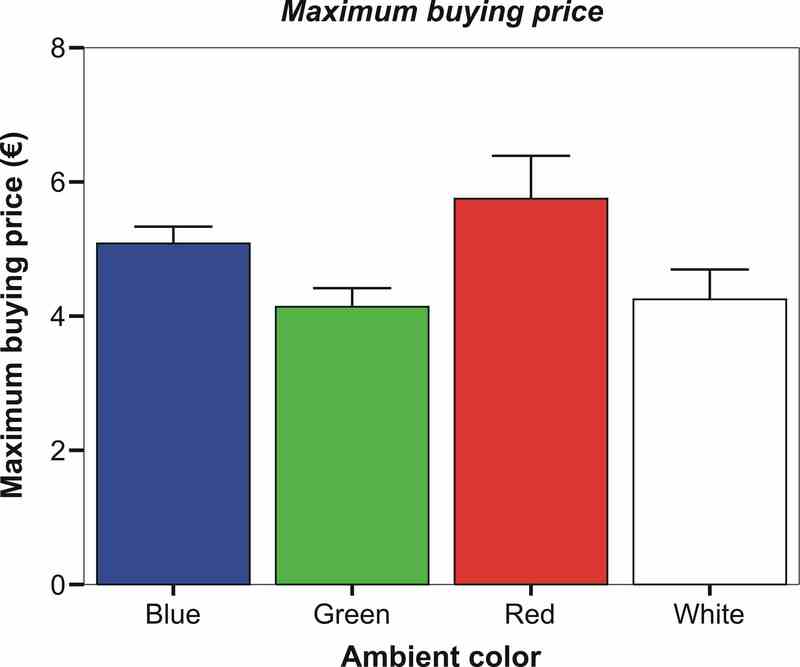 Does this interaction between color and aroma generalize to an effect of ambient color? Does maybe the illumination of a restaurant lead the customers to praise the served food? We sought to answer this question by studying the effect of ambient lighting on the taste of wine. The study was done in cooperation with the winery Fritz Allendorf (Rheingau, Germany). In order to avoid an influence of the ambient light on color of the wine, we served dry white wine (Riesling) in black glasses in which the color of the wine was not visible. Visitors of the Allendorf winery participated in the experiment. Each subject tasted the wine under only a single light-color (blue, red, white or green light; between-subjects design) in a specially designed color room. 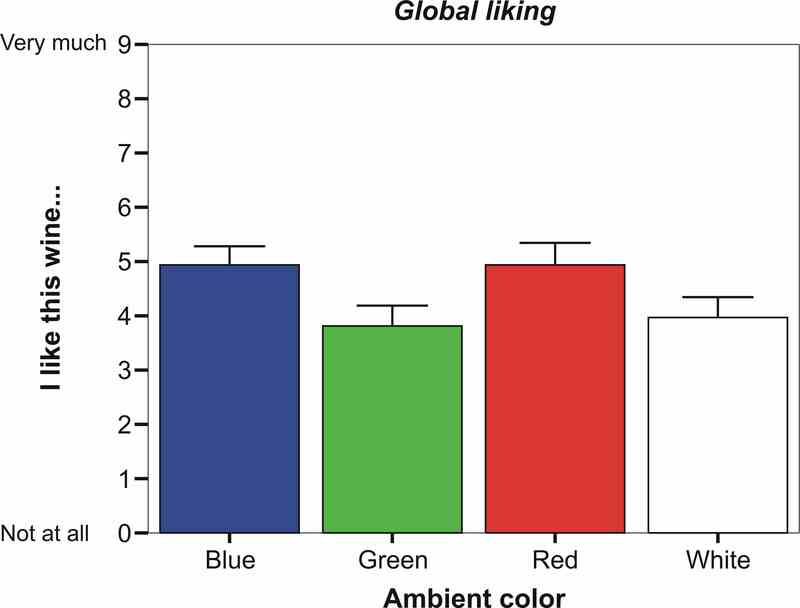 We found a statistically significant effect of the ambient color on global liking: the subjects reported to like the wine better when tasted in red or blue light rather than in green or white light. The subjects were also willing to spend over 1 Euro more on a bottle of the same Riesling when they tasted it in red light compared to when they tasted it in green light. Contrary to our expectations, ambient color had no influence on aroma dimensions such as fruitiness or sweetness, nor on the intensity or stability of the taste. This means that ambient light color has a greater influence on the overall impression of a sampled wine than on the components of its taste. To review these surprising results we did another experiment with some modifications. In Experiment 2 each subject tasted two different wines in each of the four light colors (within-subject design). We expected this method to be more sensitive to changes in aroma caused by ambient lighting, because the subjects directly experience the change in color. In addition, we wanted to find out if the more positive evaluation of the wine found in some conditions in Experiment 1 was caused by a positive or agreeable emotional state possibly induced by some light colors. Therefore we asked the subjects to evaluate their current emotional state in each light color setting. This time, ambient color had a clear effect on the aroma of the wine. Surprisingly, in this experiment the overall assessment of the wine was not significantly influenced by ambient color. Nevertheless, only 19% of the subjects could tell correctly that they had tasted only two different wines in the course of the experiment. 56% believed to have sampled more than two wines. As in earlier studies, the subjects judged the blue light to be the most agreeable, followed by red, green and finally white light. However, we did not observe a clear relation between the emotional evaluation of the light-color and the liking of the wine. In this experiment, we used a method more sensitive to small changes in aroma due to changes in ambient lighting. The task was easier this time: each subject tasted two glasses of the same wine one after another. The first glass was presented in a different ambient color than the second glass. The participant decided which wine had tasted better, sweeter and fruitier. From this data the average perceived sweetness of the wine in relation to the light color was calculated, using a special statistical method. We found that the same wine tasted 50% sweeter when tasted in red light than when tasted in blue or white light. Similarly, in red light the perceived fruitiness was highest. The overall assessment („Which wine tasted best?“) was once again not influenced by the light color. Ambient lighting influences how wine tastes, even when it has no effect on the color of the wine in the glass. Our results show that the context has a stronger influence on the taste perception than formerly believed. These findings can be relevant for the architectural designing of restaurants and wine shops. How can the effects of ambient color be explained? The simple hypothesis that whenever a certain light color makes a person feel comfortable he or she likes the wine better could not be affirmed. The emotions elicited by a certain light color do not seem to be the cause of the effects. An alternative explanation could be an influence of color on cognition, for example by making us more accessible and responsive for a certain taste. Likewise, associations could play a role, e.g. „green = immature“. An answer to these questions will have to be found in future experiments! This video from WDR "Servicezeit Essen und Trinken", 16.4.2010 shows an experiment conducted in our lab. Our results were also mentioned in a Bericht im Spiegel 6/2009 (German) on wine.